The huge variety of currently available outlets is due to the multitasking of these elements of the electrical network. Specific conditions for their use dictate certain requirements not only to their appearance, but also to functional parameters. 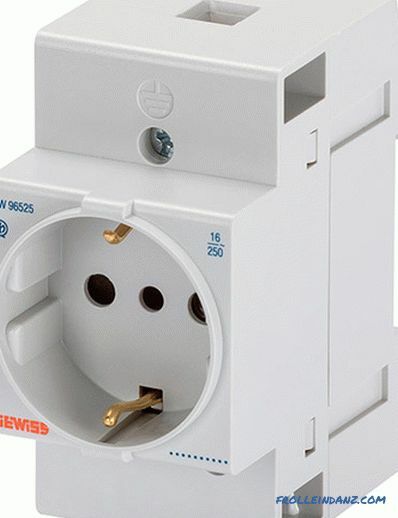 This article describes in as much detail as possible all types of sockets available today, having studied the features of which you will receive comprehensive information regarding the design differences and principles of operation of devices intended for plug-in connections. A - the standard, which at one time was ubiquitous in North America. Following the US, it began to be used in 38 countries. 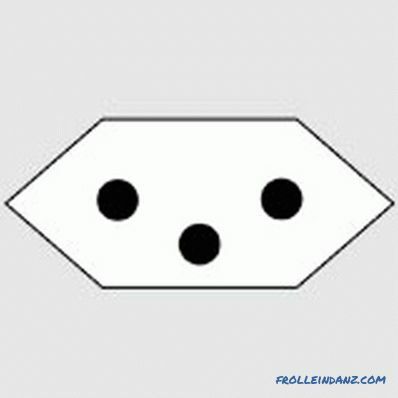 This type consists of two non-grounded flat contacts arranged in parallel. Grounding element in this case is not provided. 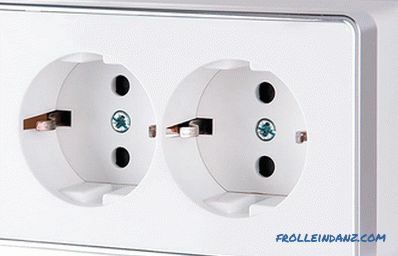 Today, such devices can still be seen in many old buildings, since they are all compatible with the modern type of plugs. Certain differences have the Japanese standard, which provides additional requirements for the parameters of the enclosures of products. B - an improved version of the American standard, supplemented at the bottom of the design with a long round contact providing grounding. 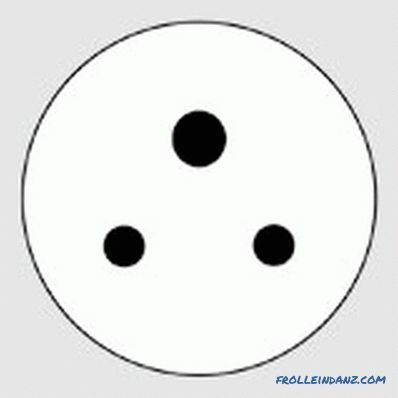 In addition to the United States, these types of electrical outlets are used in Canada and Mexico. In addition, they are found in several countries in South America, including Colombia, Ecuador and Venezuela. C is the most common standard in Europe. 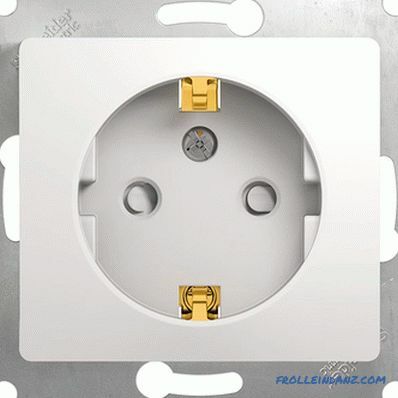 The so-called euro socket, consisting of two round contacts, is used, including in the CIS, as well as in the Middle East and in most countries of the African continent. Grounding in this design is missing. In the Russian Federation, the sizes and safety requirements for such products are defined by GOST 7396. D - an outdated standard previously used by the British in territories belonging to the British Empire. 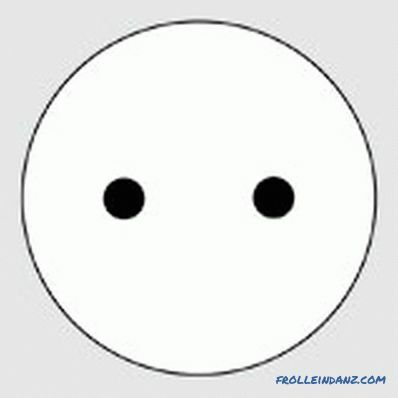 At the moment, sockets with three round contacts, located at the tops of the triangle, are mainly used in India, and are also found in old houses of other countries, where the British once had a hand in arranging power supply lines. E is a modern French standard that differs from the type With the presence of a grounding contact, which is located at the top of the device. Similar elements of the power grid are also used in Belgium and Poland. At one time they were introduced in the territory of the former Czechoslovakia. F - the European standard in the form of a design from two round contacts, supplemented from above and bottom grounding brackets. Initially, such devices appeared in Germany and began to be used for alternating current. 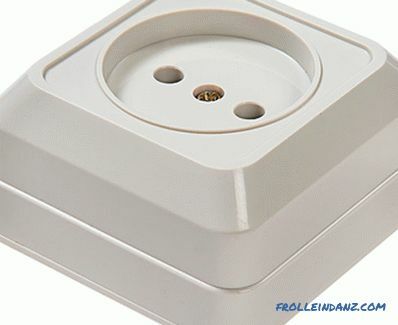 These types of sockets and plugs are also called "Schuko", which is an abbreviation of the German Schutzkontakt, literally meaning "protective contact". 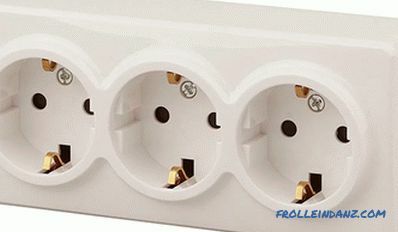 Products are fully compatible with the plugs of Russian and Soviet production. 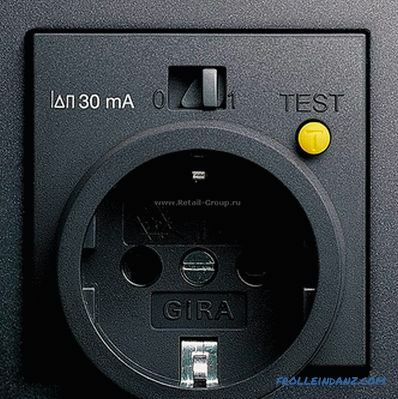 G is the British standard providing a fuse, located inside the plug. The device consists of three flat contacts, two of which are located below, and one - in the upper part. It is allowed to connect evrovilok through a special adapter, which must also be embedded fuse. This type of power grid elements is supported in Ireland, as well as in the territories of some states that were once British colonies. H —The Israeli standard is three round contacts (until 1989, flat elements), forming their location the Latin letter Y. This type of connection to the electrical network is unique because it is used exclusively in Israel. 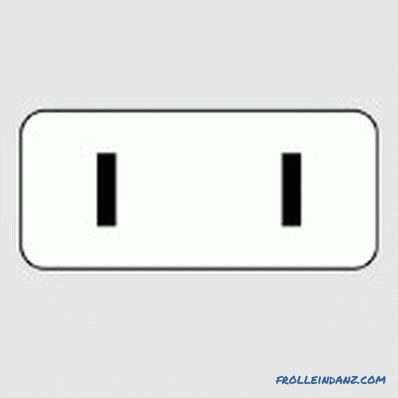 Other types of sockets and plugs are completely incompatible with it. I is a standard common in Australia and New Zealand. Two flat contacts are angled. The third is vertically located at the bottom and is the grounding element. 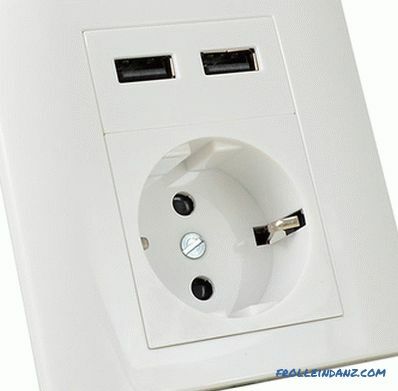 Similar types of electrical outlets are used in Papua New Guinea, as well as in the Republic of the Fiji Islands. J is a Swiss standard that has a certain similarity with type C, but characterized by the presence of a grounding contact, set aside. When connecting Evrovilok no need to use adapters. K is the Danish standard, the only difference from which French type is the location of the grounding pin installed directly in the plug, and not in the design of the outlet. L is an Italian standard that assumes compatibility with type C euroorowers. 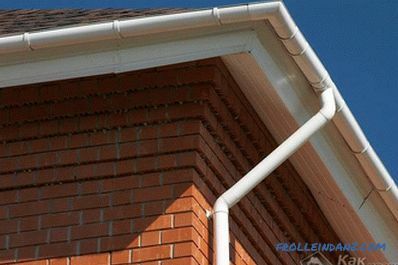 The design consists of three round contacts forming a horizontal row. In some cases, old British samples, still used in South Africa, may be indicated by the letter M.
According to European standards, the voltage in the power grid is usually 220-240 or 380V. 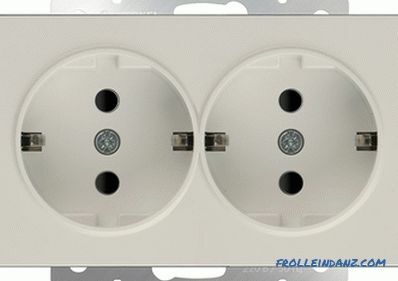 Sockets designed for 220 volts are usually used to connect various electrical devices whose power does not exceed 3.5 kW. This limitation is due to the inability of standard devices designed for low-power household appliances to cope with current strength beyond 16A. For more powerful electrical devices it is recommended to use industrial three-phase sockets for which the permissible current is 32A. Such products are rated for 380V. In addition, for certain types of sockets, a certain frequency of alternating current is provided, which is 50 or 60 Hz. The most common European standard, including that used in Russia, is designed for the first option. What are the sockets according to the method of installation? The version of the housing in this case depends on the type of wiring. 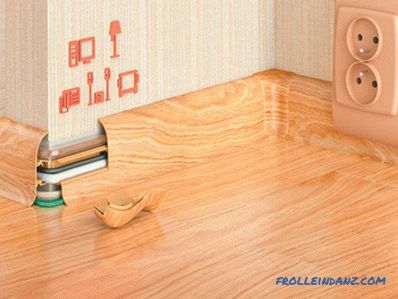 Built-in products involve the installation of the pads, on which the contacts are located, in a special box (power socket) hidden in the wall. As a result, only the protective housing of the device, slightly protruding above the surface, is within sight. 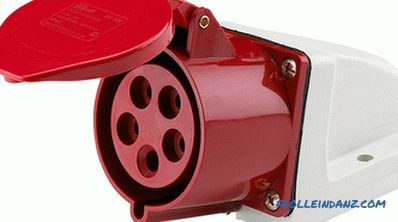 For electrical networks with grounding, sockets are used that are equipped with additional grounding contacts. 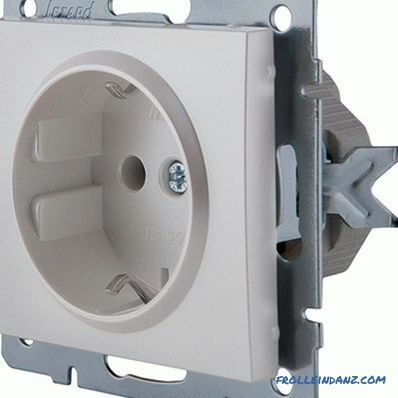 In cases with external wiring, surface-mounted structures are fixed to the wall surface. Contact elements are located under the body of the product, completely hiding the connector. There are rather original types of electrical outlets of the surface type, the installation of which consists in fixing the device on the baseboard that hides the wiring laid under it. In Russia, they are not particularly popular, since they are completely out of tune with modern interiors, and often break down as a result of mechanical effects. Portable sockets are often equipped with a cord with a plug, which allows them to be used as extension cords. However, there are also models without a cord that are connected directly to the cable that is led out of the wall. 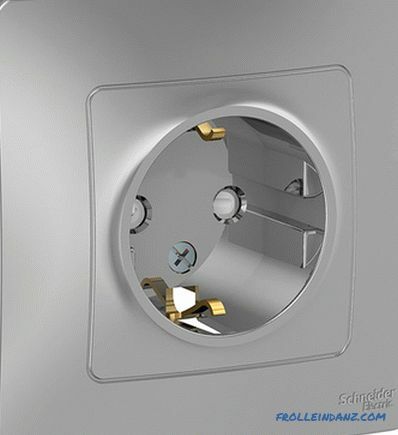 During installation, you must divide the device into two parts, loosen the construction screws, then clean the contacts and insert them into the clamping terminals. Some portable products are equipped with a power button and an indicator indicating the operating mode. 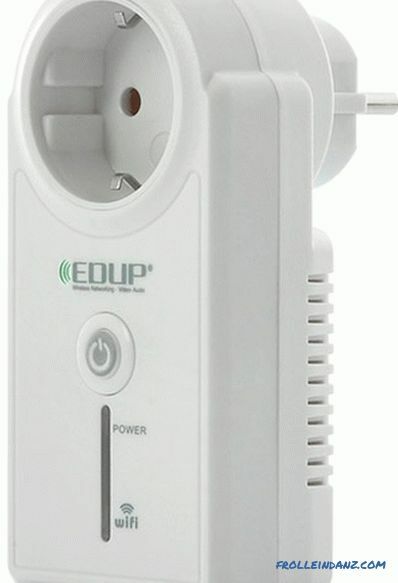 The device, which has two electrical points, allows you to simultaneously connect to the network different devices. The basis of such a product is a block, made in accordance with the standard dimensions, so that no additional floorplate is required. Structurally, the differences between the types of socket blocks are solely in the number of seats. The internal space of the housing is divided into terminals, each of which contains contacts and terminals. In cases with open wiring, it is recommended to use a waybill for attaching a receptacle unit for three energy consumers the block. For a closed electric power line, a frame with the appropriate number of sections is used. 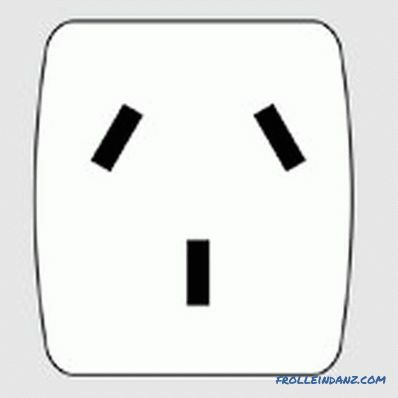 An outlet can be inserted into each section, resulting in a block consisting of three sockets. In most cases, one-pin devices are used to install four or more points. For mounting a frame with the corresponding number of sections is used. There are models of sockets, in which besides the main components, there are special electronic or mechanical components, which are assigned certain functions. 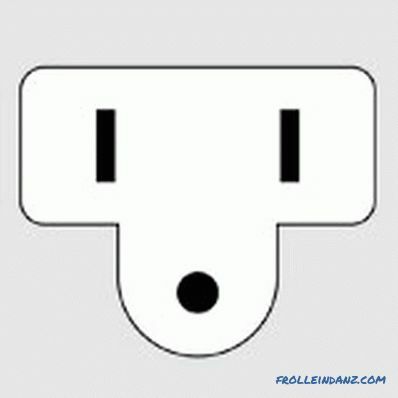 Different types of electrical outlets may have certain features that we will look at next. 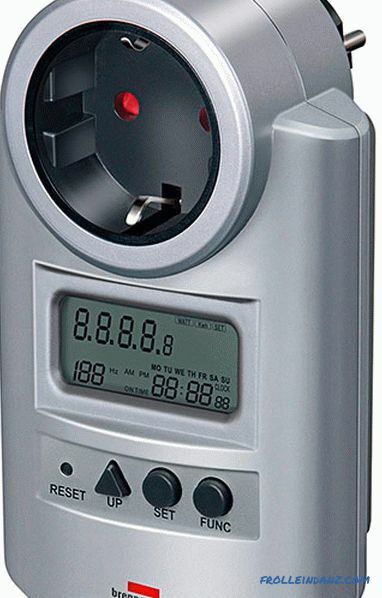 Designs with built-in RCD are designed to connect powerful electrical devices. Mostly they are installed in the bathrooms, because with an increased level of humidity in the room increases the risk of electric shock. Thanks to the protective shutdown device at the time of leakage, the built-in relay is triggered, which opens the input contacts in time. This allows not only to prevent damage to the appliance, but not to cause harm to human health. 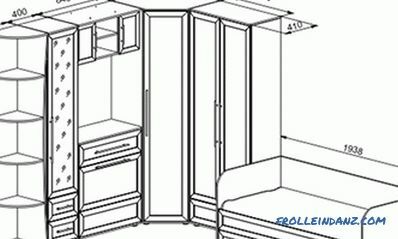 Models with curtains, which are often called “child protection sockets” in everyday life, are equipped with special panels that hide the input sockets. 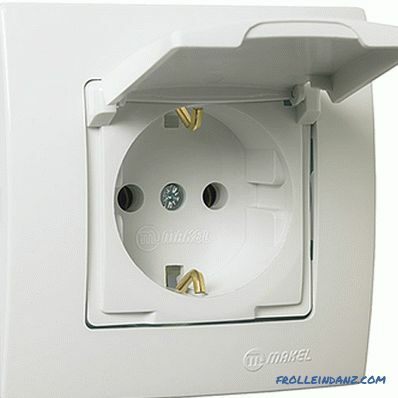 Access to the contacts in this case is possible only at the moment when the plug enters the holes. 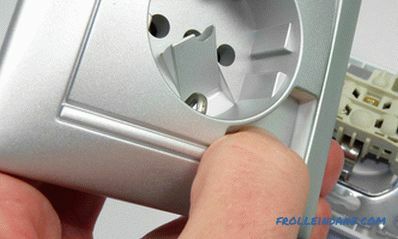 In fact, the task of the shutter is to prevent any foreign objects from entering the outlet. This is the perfect option for a child's room. 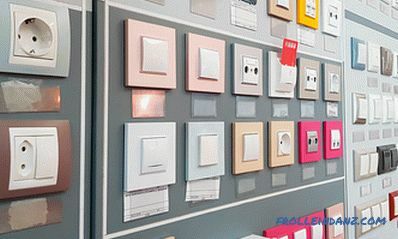 Sockets with covers are mainly used in rooms with high humidity. In this case, the protective elements prevent not only the ingress of water, but also dust inside the device. Additional mechanisms are mounted with special clamps and screws. 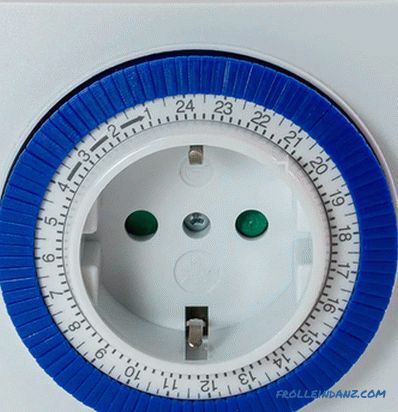 The model with a timer allows the user to independently set the time period after which the power supply to the device will be terminated. These types of sockets are quite convenient to use when operating heaters that are not equipped with their own automatic shutdown system. Designs equipped with a built-in electricity meter make it possible to control the consumption of energy consumed by a particular household appliance. The indicator on the case changes its color based on the power of the connected device. 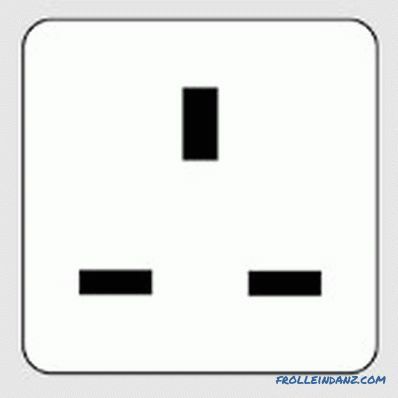 A model with a fork ejector is a great option for those whose socket is not firmly fixed in the bottom of the plug. The presence of an additional mechanism allows you to gently pull out the plug, without making much effort. 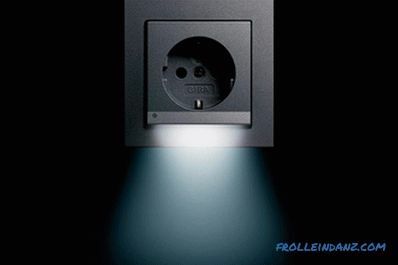 Socket with backlight, designed for use in conditions of insufficient visibility. 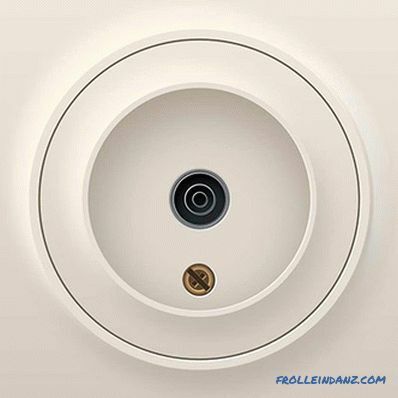 It allows even in complete darkness to quickly find a place where you need to connect a particular electrical device. Products equipped with USB output. 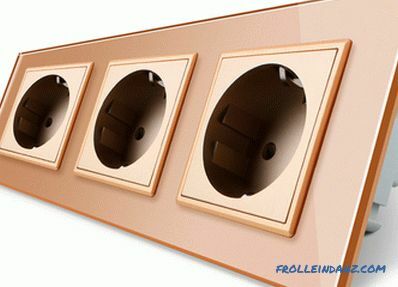 These are modern models of sockets with which you can charge a mobile phone, camera or other device at any time. A power socket with a built-in WiFi module allows you to control devices used in your home using a smartphone or tablet. Inside this device is a microprocessor adjustable at a distance, which is responsible for the supply of electricity. Through sockets , which are intermediate elements in the electrical circuit. In this case, the power wire is connected to the contacts, which does not end there, but is sent to the next device. 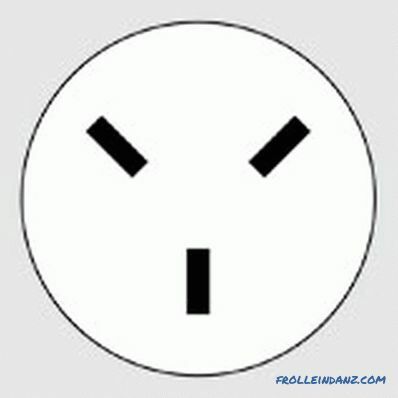 Such types of electrical outlets are used, as a rule, in the boxless dilution method. Shield connectors for use in distribution boards and installed using special metal strips equipped with snap-in mechanisms. Antenna socket, equipped with a special connector that is compatible with the tip of the television antenna cable. 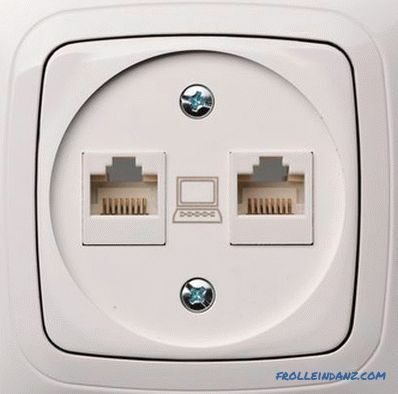 A socket for connecting to the Internet , which can also connect several computers that interact with each other. 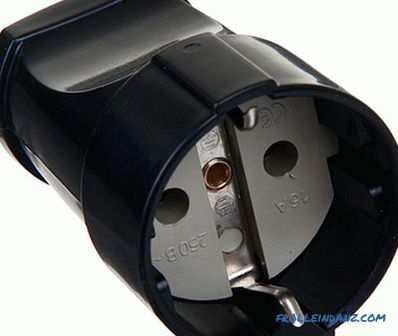 It differs from other types of devices in the number of contacts and the structure of the socket for the cable tip. 6 - the highest degree of protection against ingress of any foreign objects, including microscopic dust particles. 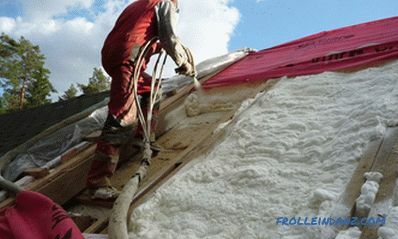 9 - absolute tightness allows the equipment to operate under water with unlimited duration. 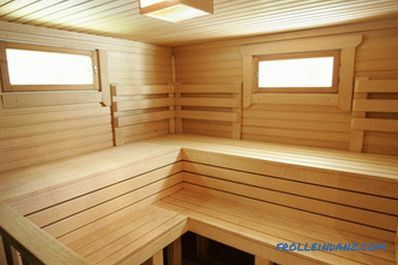 13 - are particularly resistant to various kinds of pollution, including oily substances. 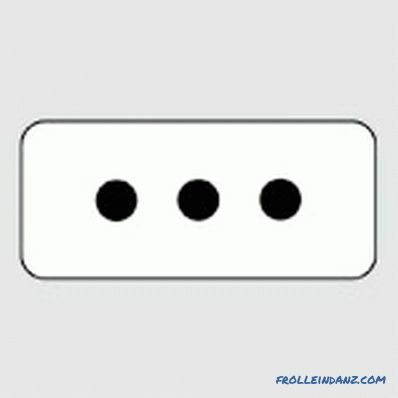 There are also other types of markings, which, for example, indicate the degree of strength of the body of the product. 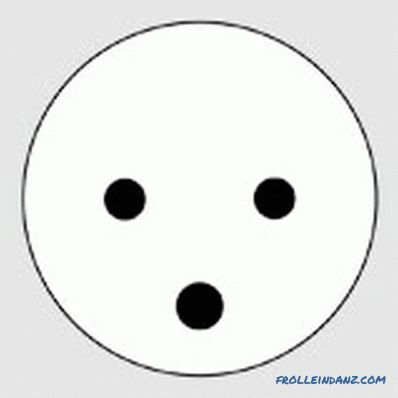 However, to consider this indicator in relation to the ordinary household outlet does not make sense.